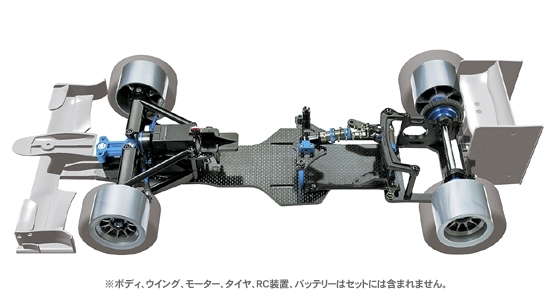 【 Taking You to the Next Level 】　The Direct-Drive 2WD F104 chassis has evolved even further. 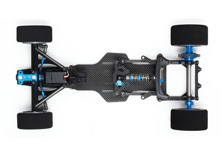 This F104 ver.II PRO chassis incorporates a pivot ball link rear suspension to improve rear traction, as well as roll and pitch dampers to enable more precise adjustment of the chassis' movement characteristics. 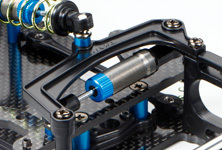 Front aluminum suspension mount enables camber angle adjustment and the 3mm thick carbon fiber lower deck has been specially designed for this chassis. 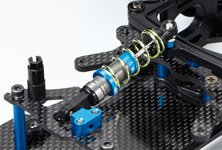 The body mount plate and center upper deck with integrated damper mount are also made from carbon fiber for overall weight reduction and increased durability. It also features a ball differential with TRF417 diff plates. Aluminum roll damper, side links, and coil springs control chassis roll movement. Aluminum pitch damper is connected to 2mm thick carbon center upper deck. Separately available TRF damper can also be used. 3.0mm thick lower deck features a narrow design. Glass tape can also be used to secure the battery pack. The information on this page is current as of July 12, 2012.